These handsome Monogrammed Poker Chip Sets feature any two or three initials or denominations you choose on both sides of all Poker Chips in the set. Each Monogrammed Poker Chip Set comes with either 300 or 500 Custom Imprinted Ace/King 14 Gram Super Heavyweight Poker Chips. It easy to have your own Monogrammed Poker Chip Set. Simply contact us at 1-800-233-0828 to order and let us know the three initials you would like on the chips. You can even have three initials on one side of the Poker Chips and any of the following denominations for free on the other side: 5¢, 10¢, 25¢, 50¢, $1, $2, $3, $2.50, $5, $10, $25, $50 $100, $500, $1000, $5000, $10,000 and $25,000. For additional information on any of our Mongrammed Poker Chip Sets, or to order, please contact us at 1-800-233-0828. 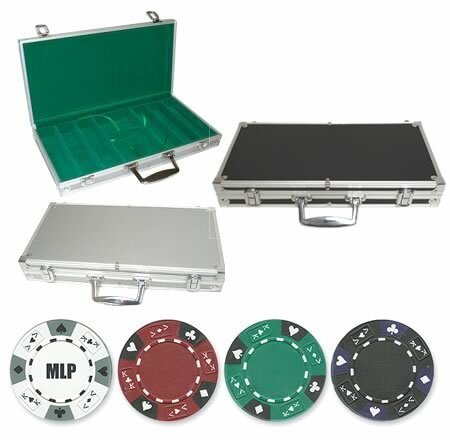 You might also be interested in our Casino Poker Tables, Brand Name Playing Cards, and other Poker Supplies.